It’s a long drive north, from Wexford to Portstewart, but you certainly appreciate the Major Inter-Urbans (motorways to you and me) when the trip to the Border takes under two and a half hours, courtesy of the M11, M50 and M1. Then you’re back on the ‘A’ roads, travelling through Northern Ireland on winding single lane roads, and sitting in traffic jams in country towns on market day wondering which idiots haven’t built a bypass. The Celtic Tiger didn’t leave us much in terms of a positive legacy, but at least we have one hell of a good road network. 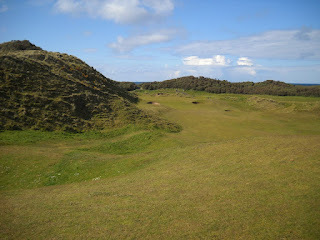 My tee time was 2.20 on a sunny Saturday afternoon, courtesy of an invitation from an American golf writer, Dave Owen. Actually, that’s a lie, because I invited myself. 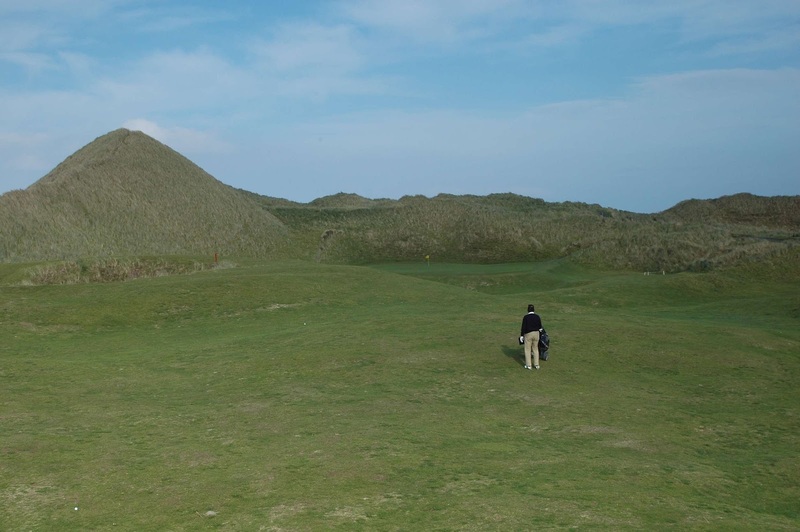 Dave wrote an article on his Irish golfing travels last year and in it he said he would be returning this Spring, so I got in touch, wrangled an invitation and arranged the weather – it was the least I could do. 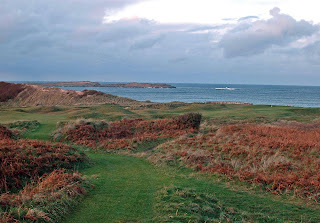 Dave was starting at Portstewart and Royal Portrush and then making his way west, playing a bunch of his personal favourites (which just happen to be mine too). 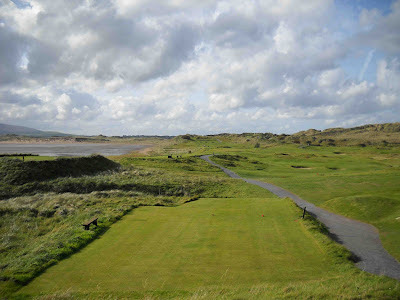 He’d brought along six friends for the journey, some of whom had never been to Ireland before, and some of whom had never played links golf before. This was a slap-in-the-face introduction if ever there was one. 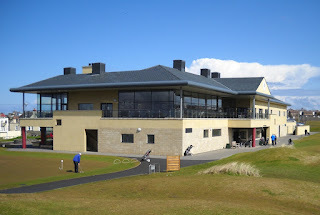 The clubhouse was opened in 2009. It is big, luxurious and perfectly positioned with a vast expanse of glass wrapped around the bar so you can look out on the course and down the spectacular 1st hole. I was watching fourball after fourball tee off, but only after most of the golfers stopped and stared at the glorious surroundings: the Inishowen peninsula rises out of the ocean to the north west, dark and brooding; Mussenden Temple stands proudly on the headland in the distance, almost directly ahead; and the perfect beach streams off into the distance below you, white caps racing like stallions across the sand. 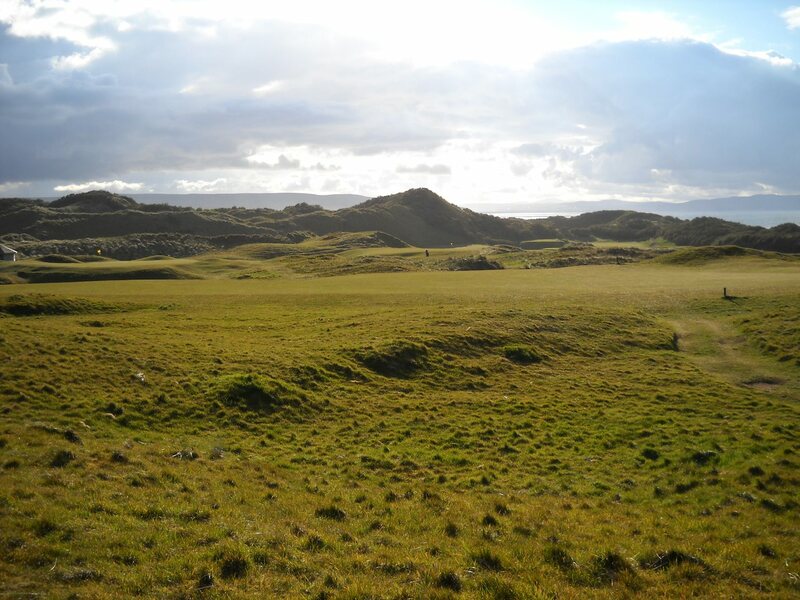 When it comes to kicking off a round of golf, it doesn’t get better than this, and the dunes that await you are as mesmerising as they are terrifying. And all this from the bar in the clubhouse! We were eating our food when Delwyn, the bar manager, passed by. He's been with the club for 22 years, so I asked him about the new clubhouse and he was happy to fill me in. 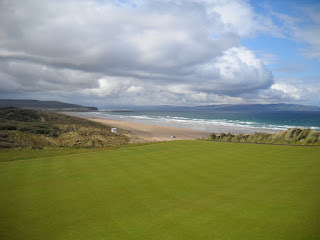 The place can host a wedding for 280, he told us, and couples regularly have their photographs taken on the 1st tee. I wondered how many brides were golfers, and how many expected their new husband to get up the following morning and return to the same spot for entirely different reasons. Liar. 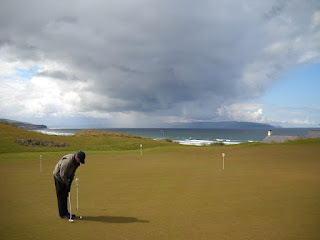 There’s no such thing as quick round of golf at Portstewart. It’s too big, glorious and tricky for that. Dave arrived shortly afterwards. I recognised him from his New Yorker picture. 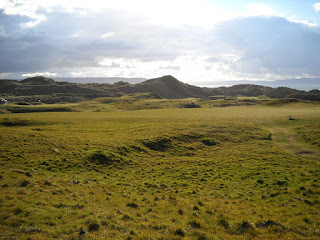 He introduced his six companions and I introduced my golf widow wife – it seemed a fair exchange. And shortly after that we were on the tee. My wife watched from the clubhouse, no doubt hoping that I started with a good drive. I’d played a match the previous day with my father and we had been thrashed 7 & 5, so I was not in the best of golfing spirits. 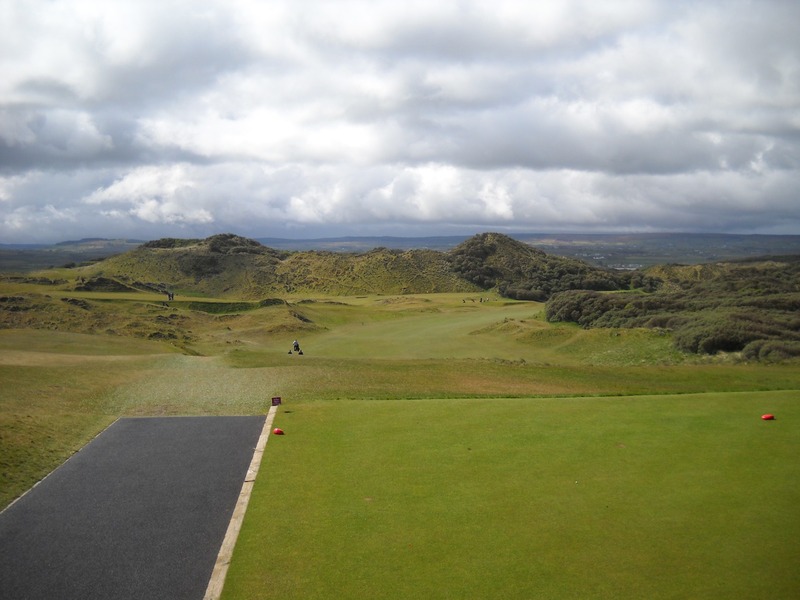 Then again, this was not about playing good golf – it was about experiencing the heady thrills of playing Portstewart again, and weaving my way through a run of dunes known as ‘God’s Own Country’… and picking Dave’s brains, of course. I was playing alongside Dave, David and Tim, and we stood on the tee and made the appropriate noises of approval, even as an anvil-head of dark clouds and rain swept across from Inishowen. They never reached us and we spent most of the next four hours playing in glorious April sunshine. 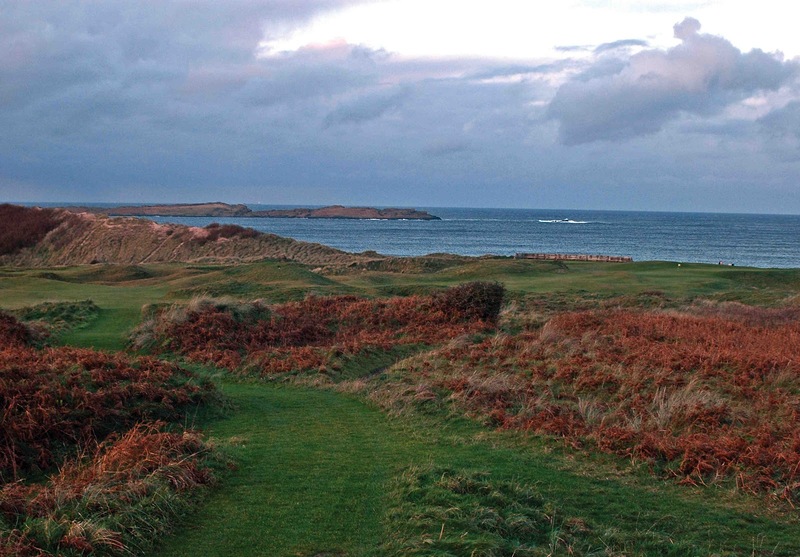 In Hooked I talk about the ‘golf experience’ of playing a course. 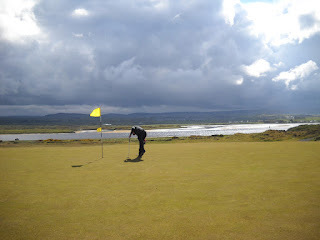 Early on, before the reviews start, I mention the different things that are a vital part of that experience: weather is one; great company another; and playing well a third. Two out of three ain’t bad, and playing poorly matters little when you’re having fun. 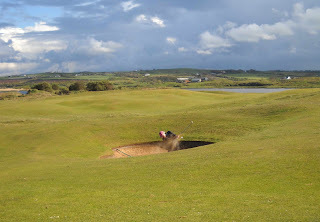 It makes you realise that you can play any course and, no matter how bad the quality, as long as the company’s entertaining you’ll usually have a blast. 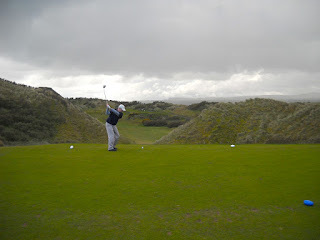 The shot of the day belonged to Dave, on the par three 6th hole, which I rate as the best 6th hole in the country. Take a look and you’ll see why. 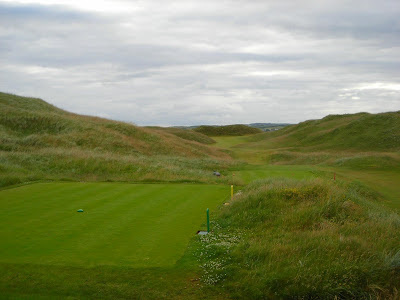 A mere 135 yards, the hole is called Five Penny Piece because the green doesn’t look much bigger than that from the tee and the sides are steep and will swat balls away into deep troughs below. If you get this far and haven’t realised the premium placed on finding the putting surface, you are guaranteed a long day. 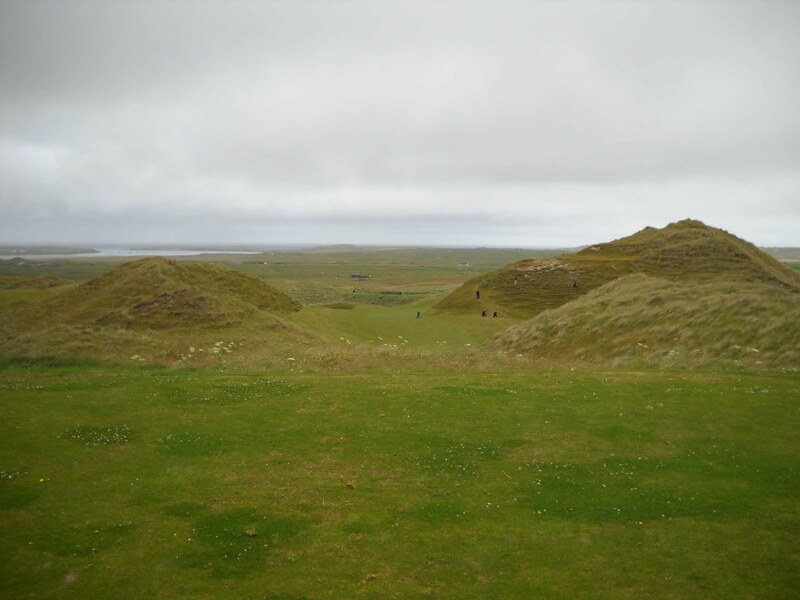 10 holes have severe slopes rising up to them. They will make you cry! I don’t know what Dave hit into the two club wind that was coming from about two o’clock, but the ball never budged from the flag. It cut through the wind and landed close to the hole. All the way I thought he was going to bag an ace and when we reached the green, his pitch mark was less than an inch away. It started the inevitable conversation about holes in one. I wasn’t contributing much since I’ve never had one, and ‘almost’ doesn’t cut it. 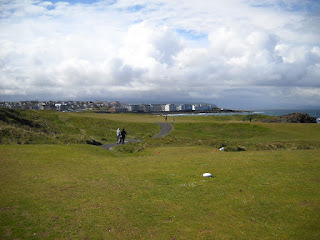 My only quibble with Portstewart is not an uncommon one. The club promises the most exhilarating start, which lasts for 12 holes, before the pace slows and then ends tamely, with 16 and 18 being the least interesting on the course. 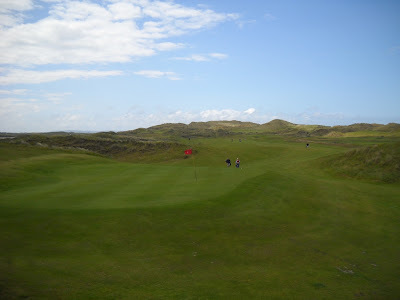 After holes 1 to 9, it would be almost impossible to maintain that level of excitement, so Portstewart offers the best of whatever’s left… but you might find yourself walking towards the 16th and 18th greens (side by side under the clubhouse), glancing across at the dunes of the front nine, at the flags of holes 8 and 9 that shimmer in the late sunlight, and at the glory of the 1st tee box that will remain with you for a very long time. Despite that sense of longing, Portstewart is a thrilling round of golf, and the bar is as welcome a spot in the evening as it is in the morning. The rest of the lads – Tony, Tim, Jack and Howard – joined us in the bar for the post round analysis and scoring. 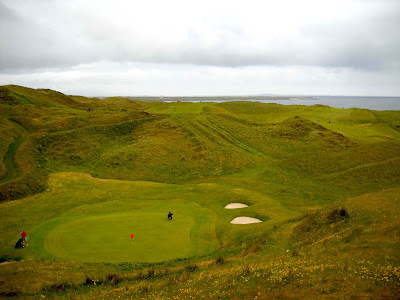 My wife and I were invited for dinner, but we were heading in the opposite direction, and I didn’t want to overstay my welcome – the guys had landed from New York that morning and were about to embark on seven days of 36 holes. They were going to need their rest. As they left, it was made clear that I was welcome to play golf in Washington, Connecticut, whenever I happen to be over that way. 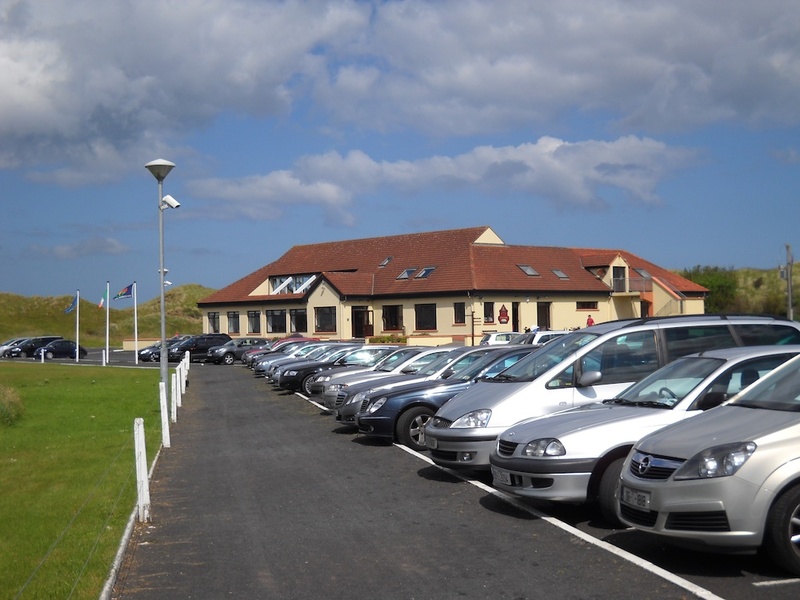 Our hotel was the York Inn, in Portstewart, overlooking the Old course. After dinner we walked into town at around 11pm and found Morelli’s open and buzzing. No, not a bar - an ice cream parlour. Despite my dinner I managed to squeeze in some Toffee Crunch and Rhubarb & Custard ice cream. That’s what I call a perfect end to a perfect day. David Owen is a writer for Golf Digest and the New Yorker. He is the author of several books, and not just about golf. 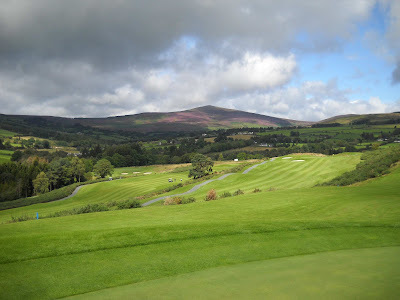 You'd think having 4000 photographs of golf courses up on Flickr would pretty much cover every course in Ireland... sadly, no. I am missing 70, and I need more photographs of another 20 or so. It is a tale of loss and regret... and no, not the latest Chick Lit by Cecelia Ahern (about her Dad, probably. Plenty of loss in that story, to the tune of billions)... this tale of loss concerns a virus wiping my desktop and consigning photographs of 30 Northern Ireland courses to the ether. 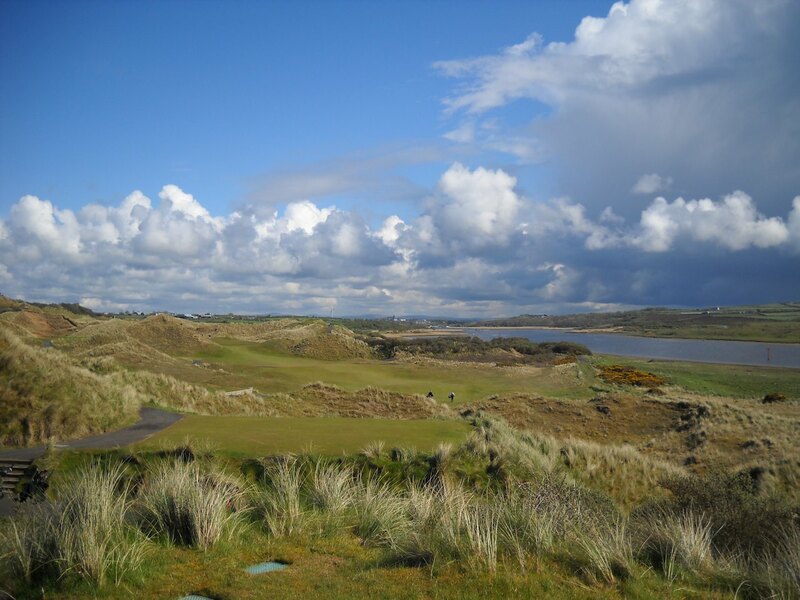 Ballycastle, Dungannon, Gracehill, Roe Park, Moyola Park were among them, as were the three greats of Castlerock, Portstewart and Royal Portrush. There there one minute; gone the next. Still, 4000 photos is probably a record - of some kind. And with 70 courses still to go, there are lots of reasons to keep playing golf across this beautiful island of ours. It's my mother-in-law's birthday today, so I thought what better way to celebrate than playing golf at Portstewart in beautiful Northern Ireland. I played with a great bunch of guys who flew in this morning from the US to begin a pilgrimage west, playing some of the most exhilarating links we have to offer, from Royal Portrush across to Carne. I am seething with envy at the courses they have yet to play. I hope the rain stays away, the sun is a constant companion and the wind is little more than a guiding hand. Good luck fellas. I shall write more in due course but I am toast and need my bed. 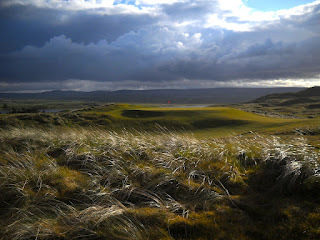 Here are a few photos that show off the beauty of the links, and the not-so-beauty of my playing companions. A short post this one - Neil (aka armchairgolfer) Sagebiel has written an intriguing piece on the House of Representatives approving legislation that awards the Congressional Gold Medal to Jack Nicklaus. They're savvy, that's for sure, and this current promotion is a no-brainer. All you have to do is fill in the entry form at http://www.yourgolftravel.com/cleveland and you're in with a chance to play golf with McDowell and Lowry, right after the Irish Open at glorious Royal Portrush. What Yourgolftravel will do with the info I don't know, but what does it matter if you get a few mailings... it's worth it for the opportunity, right! 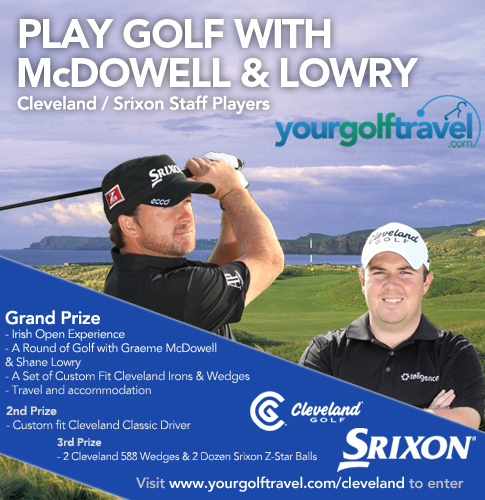 Your Golf Travel has teamed up with Cleveland Golf and Srixon to offer a very lucky golfer the chance to play golf with Graeme McDowell & Shane Lowry on Monday 2nd July 2012. 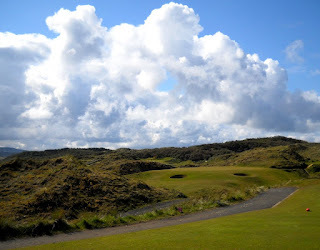 This once in a lifetime experience will start with being whisked away to watch the final day's play at the Irish Open at Royal Portrush, accommodation on the Sunday night, followed by playing with the 2010 US Open Champion and former Irish Open winner Shane Lowry. Also if that wasn't enough the lucky winner will also get a set of Cleveland Irons and Wedges to be custom fitted at their Centre of Excellence in the UK. I'm not about to quibble (I entered yesterday), but it doesn't indicate when the closing date is, and I'm not 100% convinced about how much golf you'll be playing with the two Irish stars - it says a 'round of golf' which would be incredible... or will they be standing on different par threes, demonstrating their prowess to you and every one else who's attending that day (as happens so often at sponsors' days). If it's the former, is that not the prize of a lifetime? And a hell of a lot better that a two week prize to the Bahamas or a sports car... for a golfer at least. Your non-golfing spouse might be less convinced. On a personal level, it's very reassuring and rewarding to know that sometimes I can make an impact on a person's golfing decisions... they might try a course they have never heard of... they might pick one club over another based on my comments... and then there's actually joining a golf club. 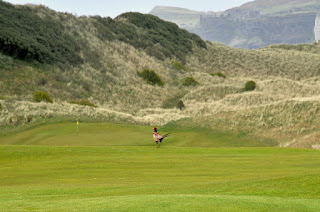 "Strandhill have you to thank for my membership, the photos up on your Flickr account are amazing. 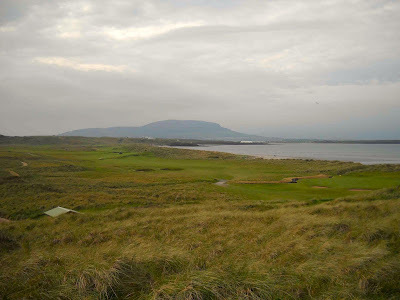 I played there and Co Sligo after going through your photos of both and Strandhill left the greater mark." Sorry, nothing more than a bit of self-congratulatory-aggrandisement... try saying that after a beer of couples. I'm not saying anything new here... but these two shots were taken 20 minutes apart. ... then on the drive home, a couple of miles away, this rather glorious panorama opened up. 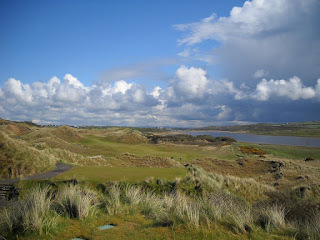 With all the Dubs piling down to Courtown and Gorey for the Easter weekend (and enjoying their holiday homes for which everyone's expected to trump up the Household Charge never mind the €200 second home charge... but that's a rant for another day), there will be lots of people looking to sneak in a quick round of golf... and there are many ways to 'distract' the family while you do so. I'd strongly recommend that you send the rest of the family off to the Gorey Craft Fair (10am - 5pm on Saturday) in the Gorey Shopping Centre (aka Dunnes Stores and other retailers). 20+ stalls selling a selection of Irish crafts. 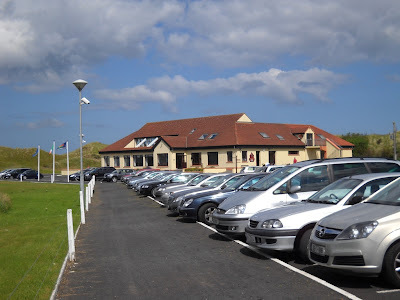 No one would argue that the cream of the crop is Courtown, which would be title-holder for the 'best parkland in Wexford' if it weren't for Bunclody's arrival a few years back. Established in 1936, there are some sweet drops to fairways, some tight doglegs and four thrilling par threes (including the watery 18th), and the course is, I heard yesterday, in great nick. 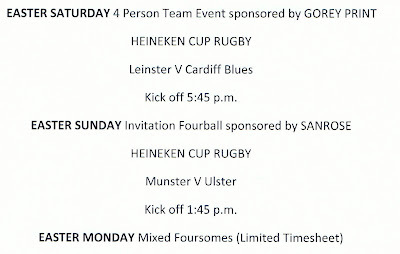 But getting out over a weekend can be a challenge, and the club is running a couple of events over the weekend... withe the Heineken Rugby thrown in. See below. A hotel too, so you can indulge your other half (even your parents if you feel inclined) in the Oceo Spa, while you swan off around the course. It is not my favourite track by any means ('sea' and 'field' summing the course up pretty well), but you won't have any trouble getting out. Neither will you have difficulty getting out on this friendly, family-run course. It's a super little track that won't ever threaten the big boys in terms of quality, but it delivers plenty of fun. 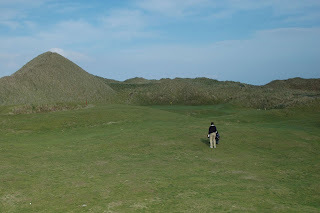 I dropped down a couple of nights ago to take some photographs and I'd forgotten how shapely a course it was... and it's matured a lot since my last visit (2008). It's a fun driving course and Tara Hill is on constant show. 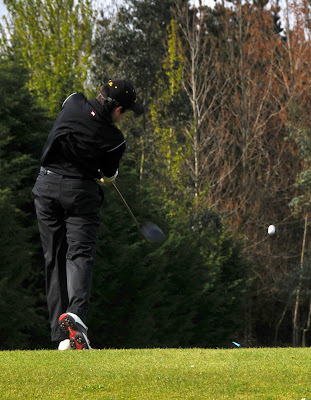 It is, put simply, a holiday course and a place where golfers grow into the game. Then again, I watched four kids teeing off and there was a serious bit of talent on show. 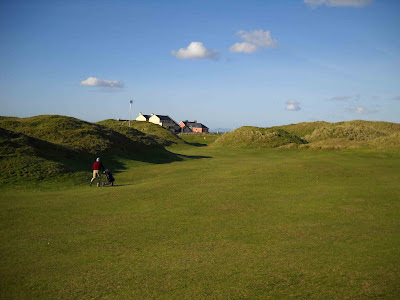 You also come back to the clubhouse after 9 holes on all three courses if you only have time for 9, but Ballymoney has a special green fee for that (€13). 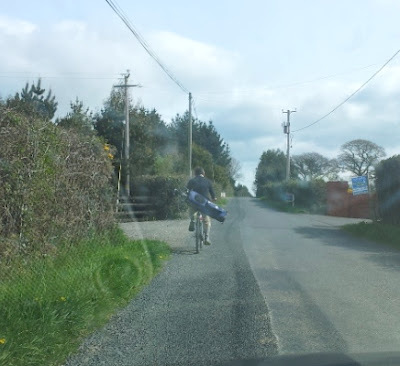 So, get on yer bike and have some fun - this lad was on his way to Ballymoney. 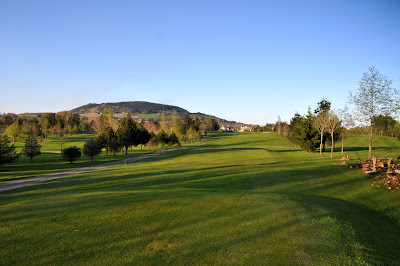 I had plans to launch into a ‘what golf are you playing this Easter?’ and then extol the virtues of visiting Macreddin Golf Club on Sunday 8th, since the Macreddin Village Food Market is kicking off again at the Brooklodge Hotel in Aughrim. I mean, think about it! You bring your other half… and even your family… and you leave them to explore the market, all that organic food, live jazz, a great bite to eat… and you go off and play a superb golf course. Quid pro quo. 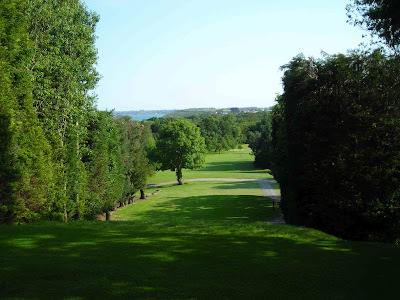 You’ll even get to wave to your family as you sail by in your buggy on the way to the 10th tee. Hey, it’s Easter Sunday – it’s all about family. Yes, that was my plan… until I discovered that the Food Market was last Sunday, and not this Sunday. 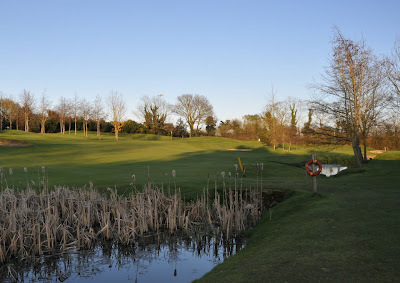 So, I’m scuppered… but if you’re looking for somewhere to play this Easter weekend, be sure to consider Macreddin. 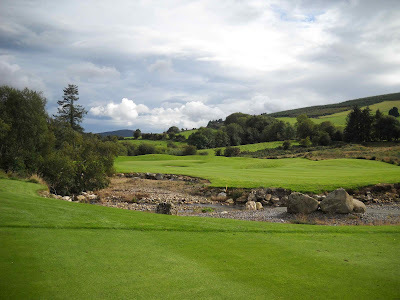 Let’s forget that it’s a quality course, designed by Paul McGinley… in a beautiful Wicklow-wooded-valley-distant-views-and-picture-perfect-river location… with some of the best holes in the country (try the 5th and the 12th). No, let’s look at the green fees, which are at a special price for the weekend. 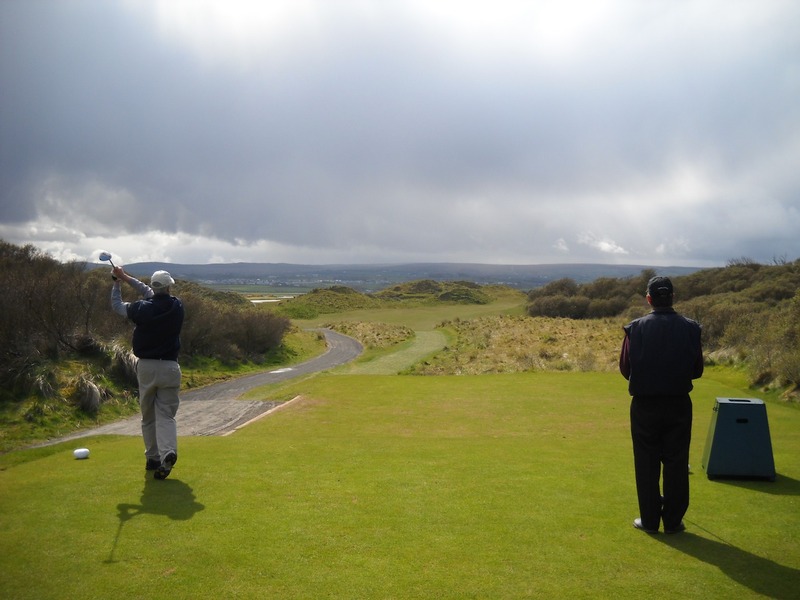 A fourball will cost you exactly €80 – so €20 per person. For an extra tenner each you can get a buggy, which is probably recommended. 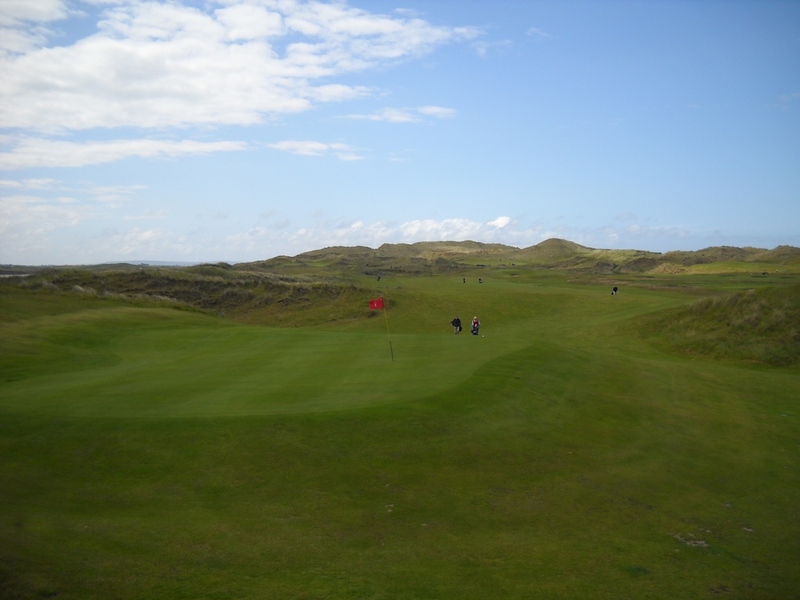 And if you don’t have a four, it will work out at €25 each… hardly an enormous increase when you consider that for twice the price you can play courses half as good. And if you don’t choose to play Macreddin… well, wherever you end up playing this weekend, I hope you enjoy it. By the way, the Macreddin market is on the first Sunday of every month.